What’s luckier than a leprechaun’s hat? 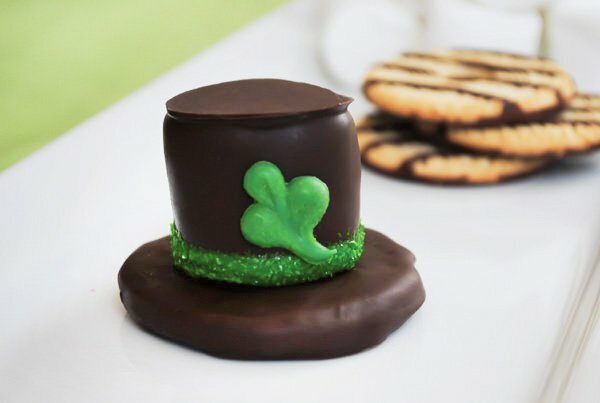 A leprechaun hat made of chocolate and marshmallow with a great cookie crunch! Hi, it’s Carrie Sellman from Half Baked, the cake blog for sweet inspiration. 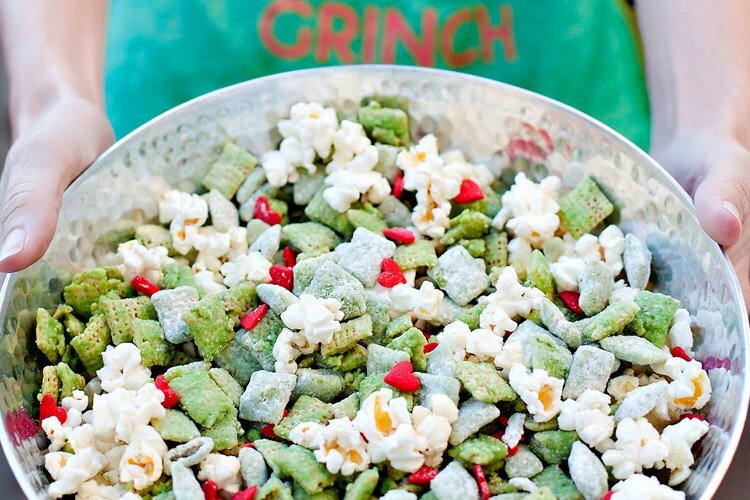 I’m over the rainbow to be here today, sharing a quick and easy treat for St. Patrick’s Day! 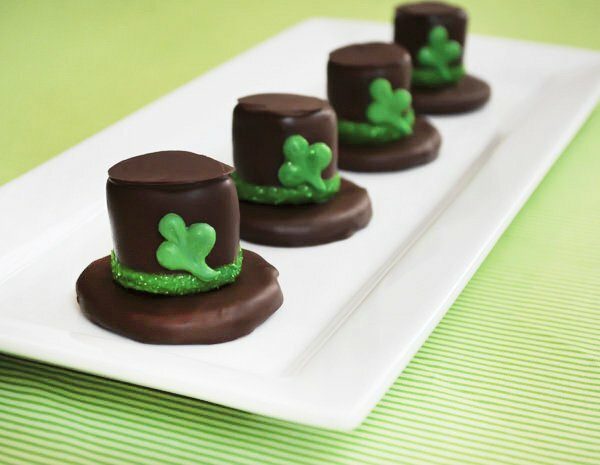 Delicious as they are cute, these little hats would be the perfect addition to any St. Patty’s Day dessert table, or a festive sweet to enjoy at home. A Fudge Stripe Cookie base is topped with a marshmallow and then coated in chocolate to create one delicious little s’more hat! 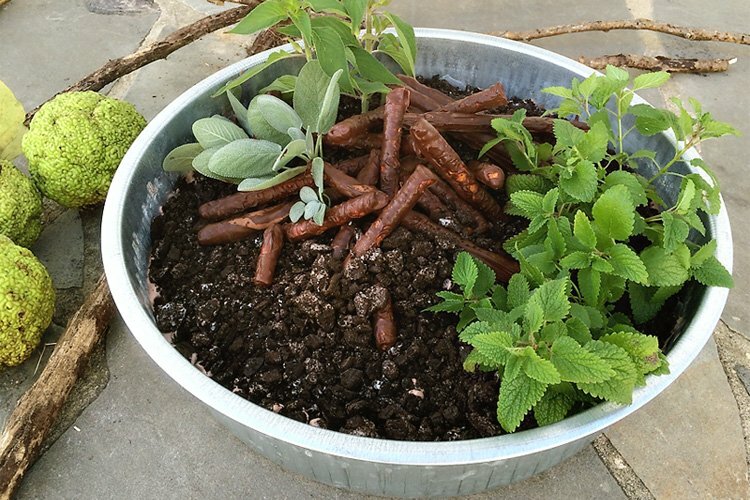 Easy enough for your little leprechauns to help make too (if you don’t mind gooey hands!). 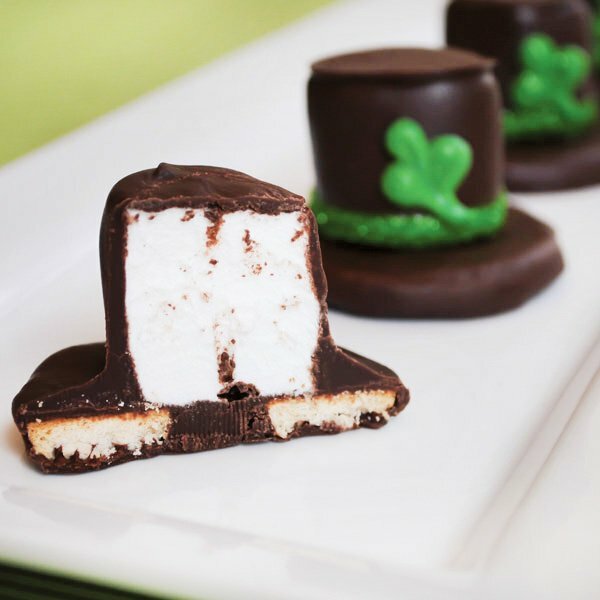 Hope you enjoy these Leprechaun Hat S’Mores… Let’s take a peek inside, shall we? In a few simple steps, you’ll be kicking up your heels and dancing the jig, wishing that every rainbow ended in a plate of these adorable s’mores! 1. Melt dark chocolate candy in the microwave, in 30 second intervals on 50% power. Stir after each heating. Repeat until completely melted. Dip Fudge Stripe Cookies into chocolate, coating completely. Shake off any excess. Set on parchment paper, top side down, until candy coating is completely set. 2. Using a toothpick, dip marshmallow into chocolate and coat almost entirely. Shake off any excess. Set on parchment paper, until candy coating is completely set. Remove toothpick. 3. Melt green candy just as you did the chocolate. Flip marshmallow upside down and insert new toothpick in top. Dip into green candy, just barely, to create a small band of green around the bottom. 4. Coat green candy band with sprinkles or sparkles. Shake off excess. 5. Place marshmallow in center of chocolate covered cookie. Carefully remove toothpick. Touch up the toothpick hole with a small dab of melted chocolate, if desired. 6. To finish the hat, attach a glittering shamrock with a small dab of melted green. Spoon some of the remaining melted green candy into a piping bag, ziplock bag or squeeze bottle. On parchment paper, make three small dots of candy in the shape of a triangle. Each dot should be about the size of a chocolate chip. Using a toothpick, swirl the three dots together to form a shamrock shape. Swirl the bottom two dots together first, then the top dot. Pull toothpick straight down to form the stem. 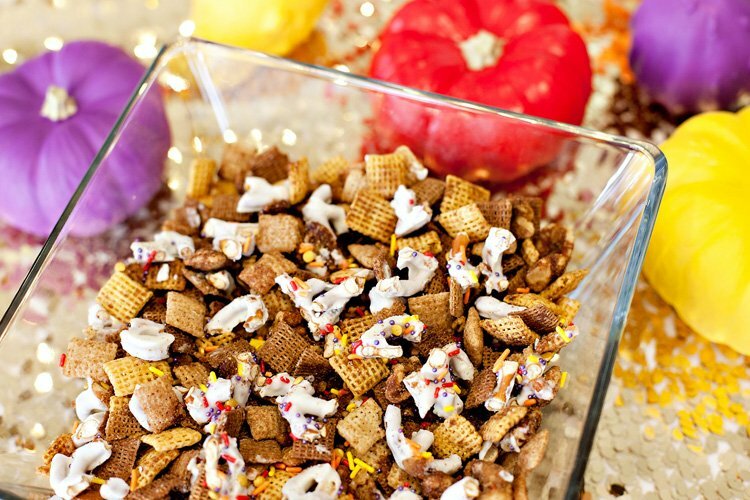 Before candy hardens, cover with sprinkles or crushed cake sparkles. Once shamrocks have set up, dust off excess sparkle. 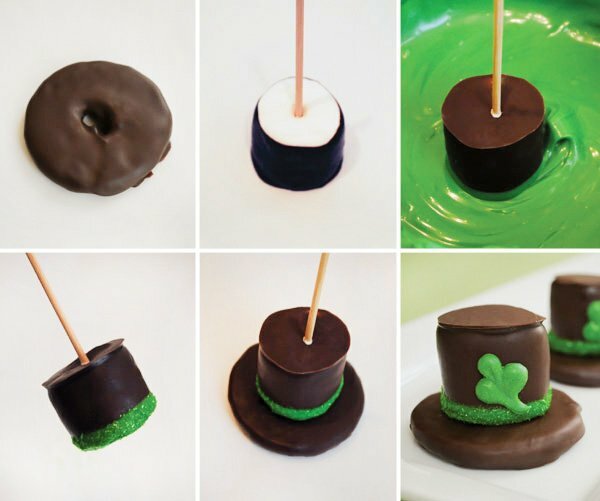 Your shamrocks are ready to decorate a hat, cupcake or other St. Patty’s Day dessert! Your finished treats can be stored for several days in an airtight container, at room temperature. Hope you enjoy my Leprechaun Hat S’mores! Happy St. Patrick’s Day! These are SOOOO cute! I am definitely going to make them with my kids on Friday – thanks! 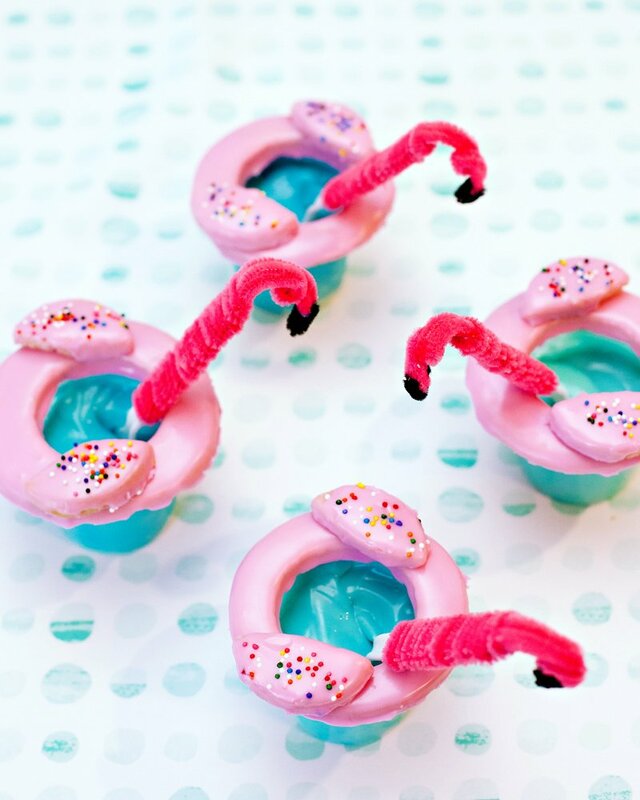 These are too cute & a must do! 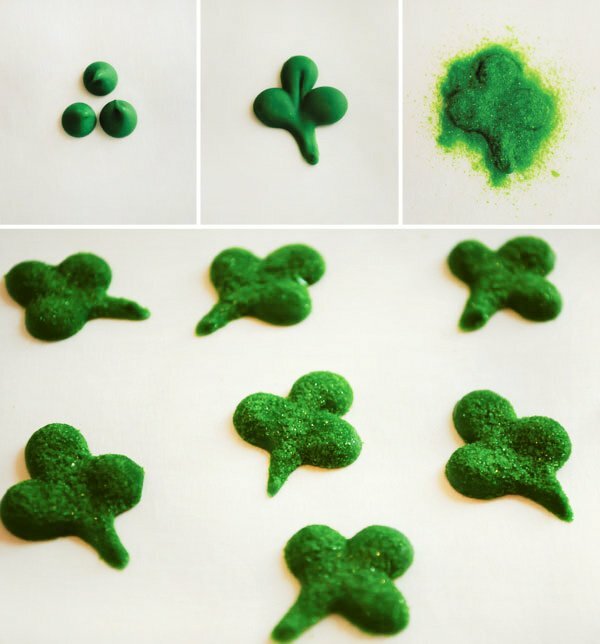 These are so fun and perfect for our St. Patty’s celebration! Thanks the tutorial. These are adorable. Making these this weekend. I made these, but instead of fudge stripe cookies, I used the mint oreo fudge dipped cookies, then I didn’t have to dip the bottom half of the cookies. I also found edible glitter icing at the grocery store and used that to decorate the hat with – glittery shamrocks on the tops of the hats, not on the side – I was on a time crunch and couldn’t wait to pick them up and ice them… Nothing like waiting until last minute – But my school staff loved them, and wanted to know where I got the idea from, so I sent them your weblink! CHEERS! I love these and I am sure my kids would too! 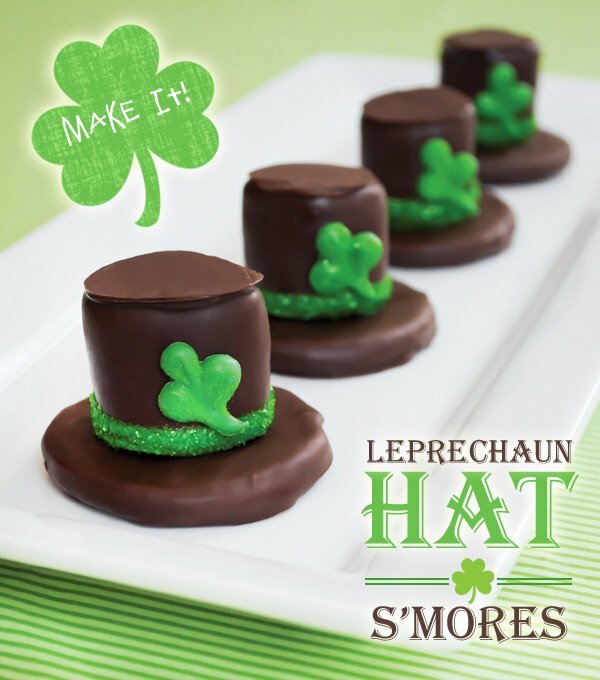 OK, I'm having a St. Patrick's Day wedding……And these WILL be on my table! Seriously!? Are you getting married? Cute! Hmmm… What about Girl Scout Thin Mints? Too small? Such a clever, yet simple little treat! They remind me of an Irish-ized version of those utterly indulgent cookies we used to prize above all else as kids: Pinwheels. They were chocolate covered marshmallow wheels on a cookie base. They seemed as big as out heads back then. Definitely not as easy as It sounds the pictures definitely are miss leading my St. Patty’s day ones turned out to be a mess although we did have fun trying to fix them. Mine were FUGLY!!!! but delicious I used Thin-Mint cookies. Of course u are! The look great! Can milk chocolate or semi sweet chocolate be used? I'm going to use my thin mint girl scout cookies for the base.